1. Remove cartridge from your printer. 3. With the tape covering the contact place cartridge back into printer. 4. The printer will perform and alignment page. 5. Once an alignment page has been printed remove cartridge from printer. 6. 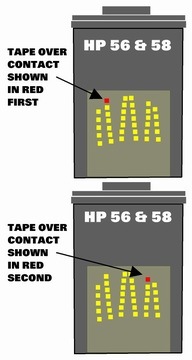 Place a piece of tape over the second contact shown in red. 8. Printer will print another alignment page. 9. Once the second alignment page has been printed remove cartridge from printer. 11. Place cartridge into printer. Cartridge should now read full. contact point. This will make reading the cartridge difficult. this will allow you to reset the ID system & Ink Level Indicator built into the printer. Remove cartridges from you printer. on the contact points when inserting cartridges. error message at this time. This is not uncommon and is nothing to be concerned about. Place cartridge back inot printer. Cartridge ink level indicator should now read full. In some cases this process does not fully work.